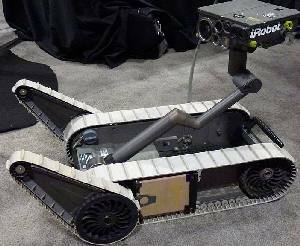 As a key partner in the U.S. Army’s Future Combat Systems (FCS) program, iRobot is developing a next-generation SUGV, a portable, reconnaissance and tactical robot that can enter and secure areas that are either inaccessible or too dangerous for soldiers. SUGV provides real-time intelligence and complete situational awareness while keeping troops out of harm’s way. 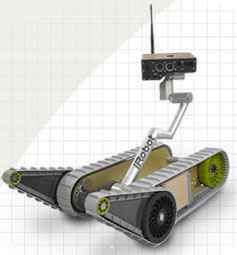 Like its big brother, the iRobot PackBot, SUGV is a highly integrated, waterproof and shockproof robot. Weighing less than 30 pounds, SUGV is small, rugged, and modular. SUGV is small enough to go where soldiers can't or shouldn't. 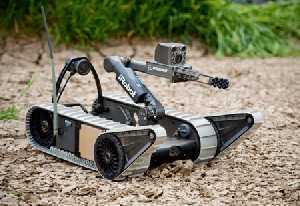 Adaptable and expandable, 310 SUGV accommodates a wide range of payloads and sensors, including a dexterous manipulator. 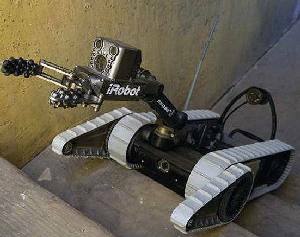 310 SUGV features a wearable controller, heads-up display and game-style hand controller, making the robot ideal for dismounted mobile operations.